Percy Grainger’s Lincolnshire Posy is one of his masterpieces. 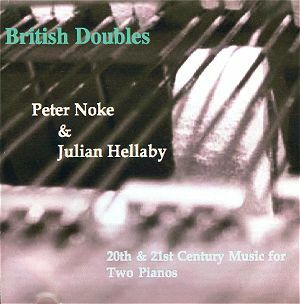 Written originally for wind band, and arranged shortly afterwards for two pianos, the six movements are more than arrangements of English folksongs. They seem to be free fantasias, moving where the musical fancy took the composer. The colourfulness of the band version is missing in this arrangement, but the textures are clearer. It’s like drinking a glass of water as opposed to vintage port. Unfortunately, the sheer scale of the final two pieces - Lord Melborne: War Song and The Lost Lady Found: Dance Song – is lost. If you can clear your memory of the Eastman Wind and the London Wind Ensemble’s performances then there’s no problem. Grainger did himself a slight disservice by making this arrangement because of this miscalculation – one of the very few he ever made, it must be said. After this, the major portion of the programme is rather less interesting. Downes’s Sonata takes to the Old Testament for its starting point. It’s a serious piece commissioned by the International Society for Russian Jewry. The outer sections of the first movement are lovely but the middle section, punctuated by loud repeated chords in the bass, is somewhat banal – we’ve heard it before. The notes tell us that the movement ends with a return to the pathos of the opening theme. Simplicity would be a better and more honest word, because it is this very simplicity which makes the slower music so good. The middle, slow, movement is interrupted twice by faster music but I don’t really feel a progression from start to finish. The finale is described as jubilant – rather heavy handed jubilation – then comes a section of sinister foreboding. I might have enjoyed the work more had I not bothered with the notes. Overall, I find little growth in the music, and no real purpose. Give me more of the contemplative music from the first movement; there was really interesting stuff which could be worked upon. The disk ends with Ramskill’s Bagatelles. These are three small jazzy pieces much in the manner of Constant Lambert’s Trois pièces nègres pour les touches blanches but lacking that work’s easy and laid back communication. These are pleasant enough, and they won’t scare the horses, but neither this nor the Downes leaves me wanting to hear any more of these composer’s works. Between Downes and Ramskill comes Malcolm Arnold’s raucous Ragtime - written when he was 19 years old - which shows exactly how to marry classical and jazzy languages with consummate ease. All in all, this disk is a bit of a mixed blessing, half of it being well worth repeated hearings, and the performances are very good and committed. The recorded sound is a bit tinny but the ear quickly adjusts to this.